When I was appointed safety program manager (airworthiness) for the Cleveland FSDO, one of the duties assigned to me was to conduct the Charles E. Taylor Award Program, the purpose of which is to honor the mechanics who have been connected with aviation maintenance for 50 years or more. However, one question always came up about the program: Who was Charles Taylor? I was embarrassed because I didn't know the answer. So I did some research, and here's what I found. When Orville Wright died Jan. 30, 1948, Charles E. Taylor became the only surviving member of the three who built the first airplane. 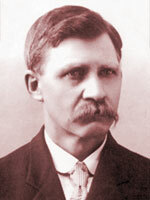 Charlie Taylor was the only employee and intimate associate of Wilbur and Orville Wright throughout the critical years. Without precedent or fanfare, Taylor built the engines for the Wright's first planes to their designs. This article, written in 1948 while Taylor was living in retirement in California, was first published in Collier's, Dec. 25, 1948, and was reprinted in Air Line Pilot, December 1978. Taylor died Jan. 30, 1956, at the age of 88.